It has been challenging to find light fluffy gluten free and wheat free bread recipes. The last thing you want to add to you burger is heavy dense burger buns. How do you make bread recipes when you are trying to avoid wheat, gluten and eggs? It is actually easy and simple. I generally always use rice flour, brown or white. Since due to allergies I can't use almond flour or other alternatives. Flaxseed meal is also a great substitute for eggs however if you are allergic to flax seed try using tapioca flour instead. Tapioca flour isn’t an egg substitute however it helps to hold everything together. This gluten free bread is still a little soft on the inside and crispy on the outside. They are not dense. I find that it is better to make smaller buns and a little on the thinner side. There is no need to turn on your oven for this recipe as you cook this bread recipe on the stove top. 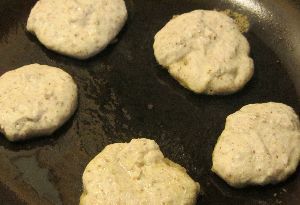 Start by mixing together Rice Flour, Flax Meal and Baking Powder, mix well. Next add seasonings and mix. Add water and mix ingredients together, batter should be a little liquidy (if needed add a little more water, 1 tbl at a time). Heat 1 tbls of olive oil in a fry pan on medium heat. Once warm place 1 tbl of batter into pan (put as many as you can fit into pan, I did four to five at a time). Allow cooking for 3-5 mins on each side. Continue to cook until all batter is used. Serve immediately, if keeping overnight place into a zip lock bag and leave out on the counter. Looking for a recipe idea for these mini burger buns? 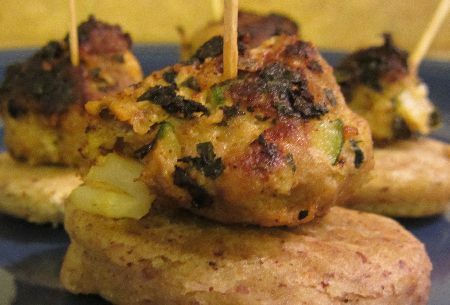 Click here to view a recipe for Turkey Meatballs with Cauliflower and Zucchini. Return from Wheat Free Bread to Food Allergies Home Page!